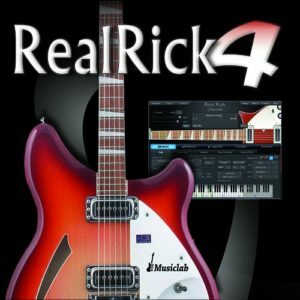 RealRick 4 virtual guitar instrument brings the incomparable Rickenbacker Guitar sound to your studio, 6-string and 12-string! RealRick 4 virtual instrument captures the unmistakable sound of a legendary Rickenbacker® 360 electric guitar, which became permanently intertwined with the sound of The Beatles. 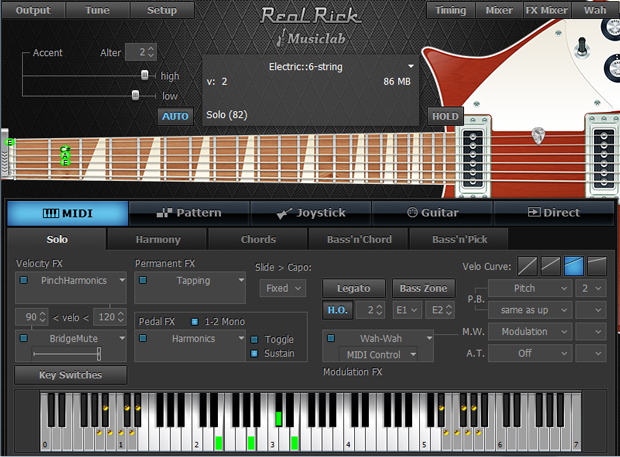 RealRick 4 is a sample-based virtual instrument with an innovative approach to guitar sound modeling and guitar techniques emulated on a standard MIDI keyboard. The Rickenbacker 360 is a semi-acoustic electric guitar. It features stereo or mono output. Beside the 6-string, also the 12-string version was sampled. 24-bit 96kHz high quality dry samples recorded directly from pick-ups let you easily create any desired guitar sound using your favorite amplifier simulator. John Lennon would own at least four models, George Harrison’s double-bound 360/12 (the second one made by the company) defined a new tone at the other end of the audio spectrum. Its ringing sound embellished “You Can’t Do That”, “Eight Days a Week”, “A Hard Day’s Night”, “Ticket To Ride” to name just a few. Jim McGuinn made the bell-like quality of its tone the foundation of the Byrds’ early style. The Who’s Peter Townshend, Creedence Clearwater Revival’s John Fogerty, Steppenwolf’s John Kay, and many other well-known 1960s guitarists became faithful Rickenbacker® users. Groups like Oasis, Pearl Jam, Radiohead, U2, and other of today’s top acts include Rickenbacker® guitars in their musical arsenal. 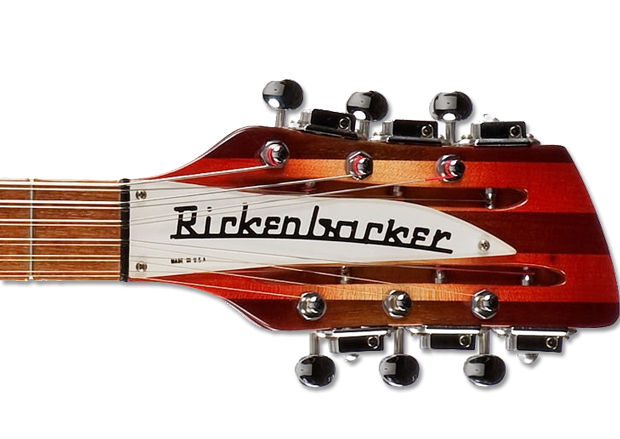 Rickenbacker® is the principal guitar of artists such as R.E.M.’s Peter Buck and Against Me!’s Laura Jane Grace, and many others. RealRick ships with IK Multimedia Amplitube Custom Shop software! AmpliTube Custom Shop is a full-featured version of AmpliTube, with 24 gear models included for recording and mixing in your favorite Mac/Win DAW or for playing on stage or practicing at home. Plus, the included Custom Shop allows you to try and buy over 200 new gear models available. You can now build your own collection of amp and effects models with a level of customization never seen before and at prices never so affordable.